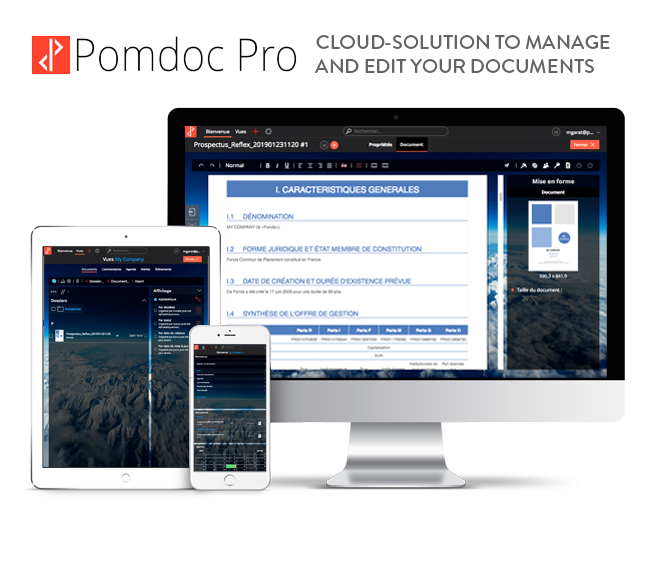 CREATE, MANAGE AND EDIT YOUR DOCUMENTS. All contributors (editors, graphic designers, experts, etc.) can intervene at all times without blocking the others. A single version, always available and up to date so you no longer lose time with versionings and corrections. Graphic standards that apply easily and uniformly to all your documents, even if you generate them independantly from one another. With our unique graphics engine, you can easily create them and link them to your data. Edit your documents without limit and export them into PDF, MS-Word or XLIF (translation) as much as you like. Gather all the participants around one document, wherever they are (hôtel, regional agency, roadshow, etc.). Quick implementation of your document libraries. Define the perimeter of your documents. Formalize you graphic standards, your taxonomy and your data. Log in and make the most of your documents with all the editing and export features. Annual access whatever the number of users!